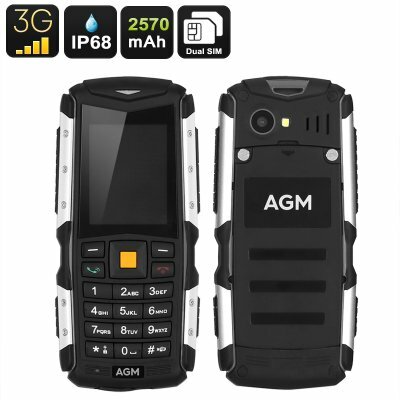 Successfully Added Rugged Mobile Phone AGM M1 - IP68, Dual-IMEI, 3G, Removable Battery 2570mAh, 2MP Camera to your Shopping Cart. The AGM M1 is a cheap mobile phone that functions great as a backup phone for outdoor enthusiasts and the elderly. With its traditional keyboard design, this cell phone is easy to operate by people of any age. It additionally features IP68 protection, making it fully resistant against water, drops, and dust. No longer will there be a reason for you to worry about damaging your phone when dropping it or exposing it to water. This IP68 Rugged phone is virtually indestructible and will keep you connected no matter where you're at. On its sophisticated 2 Inch display, this mobile phone portraits everything in bright color – allowing you to efficiently use it even while exposed to bright sunlight. With its 2MP snapper, this rugged mobile phone allows you to shoot pictures and video whenever you head outside – letting you capture all those amazing upcoming memories. Allowing you to stay connected to two network providers thanks to its Dual-IMEI numbers, this rugged mobile phone brings along ultimate connectivity anywhere you go. Perfect for those who often travel abroad or like to separate their work and private like – with this rugged cell phone at hand, you’ll always stay connected. With 8GB of external memory support, this mobile phone offers plenty of space for you to store all your contacts and pictures snapped with the phone’s camera. Thanks to its massive 2570mAh battery, the AGM M1 cell phone delivers a stunning 16 hours of continuous usage time and an unbelievable 600 hours of standby time. With all this power at hand, the cell phone is perfect for those of you that often head out for days in a row or for the elderly that do not think about recharging their device every day. This rugged mobile phone comes with a 12 months warranty, brought to you by the leader in electronic devices as well as wholesale electronic gadgets..